Coinage of India, issued by imperial dynasties and middle kingdoms, began anywhere between 6th century BC to 1st millennium BC and consisted mainly of copper and silver coins in its initial stage. The practice of minted coins spread to the Indo-Gangetic Plain from West Asia. The coins of this period were called Puranas, Karshapanas or Pana. 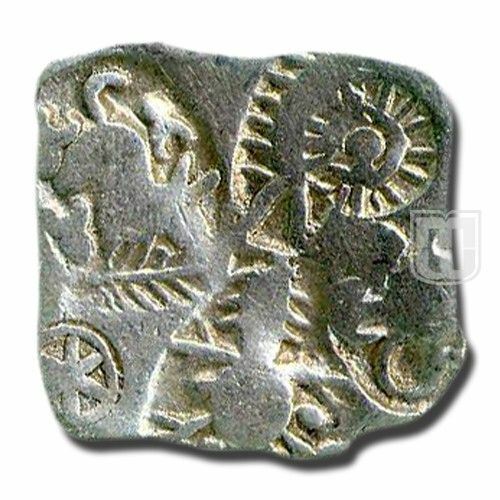 The earliest Indian coins were not disk-shaped but rather stamped bars of metal, suggesting that the innovation of stamped currency was added to a pre-existing form of token currency which had already been present in the Mahajanapada kingdoms of the Indian Iron Age. This category covers coins of e.g the Magadha Kingdom and the Mauryn Empire.